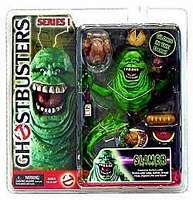 Description Of Item: SLIMER Ghost Busters Action Figure Series 1 Neca. Ghostbuster. Slimer comes with a turkey with removable legs, bottle, bread, fruit, platter, pie, and an ectoplasm base. In addition to that, Slimer features a cut neck, wrists, and ball jointed shoulder articulation. He also glows in the dark!